So Etude House finally created a brow tint that is semi-permanent. Well, semi-permanent in a way it lasts more than a day! I was a bit busy with shoots and projects, I had no chance to really play with my brows so I asked my dear mom-in-law (who is into brow tinting) to try this out! So far, I am quite surprised with the result! Safest color to start with especially if you have color-treated / light brown hair. It looks like a regular brow mascara tube but the brush is what makes it unique! It comes with a small approx. 2cm long bristle. As for application, make sure the brows are clean, well-trimmed and no other skincare products are applied in the area. It is much better to apply a liberal amount because it would be difficult to "peel off" the product if you applied thinly. Now, fret not if you made a mistake, you can always use a cotton bud dipped with makeup remover and remove excess product. Once you are happy with the coverage, let it sit and dry for at least 2 hours! My mom-in-law tried both 2 hours application and overnight application! She preferred the latter because the tint is more obvious and it stays longer than 2 days! After drying completely and after the desired "cooking time", gently starting from the tail of the eyebrow. 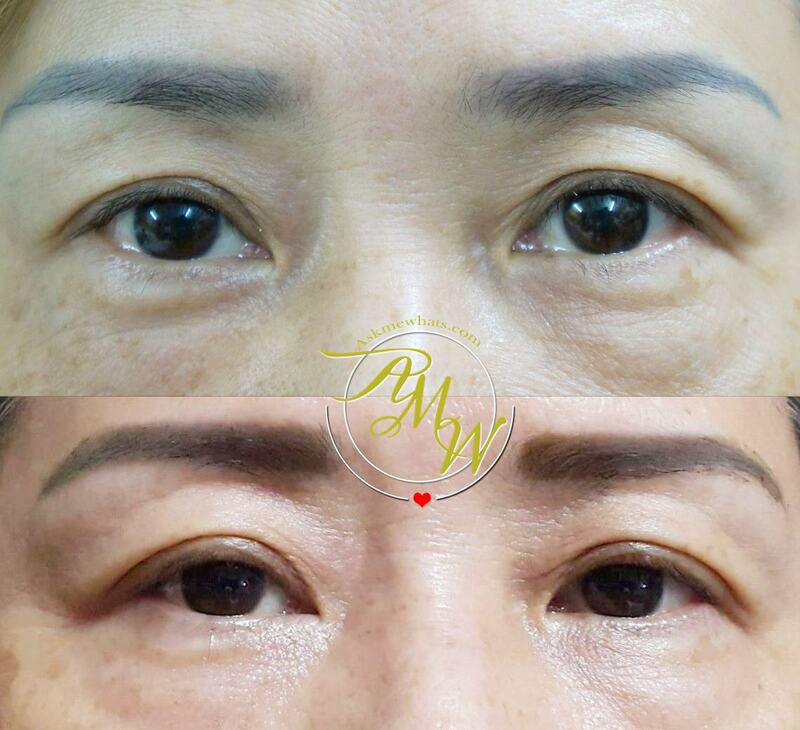 Just to show you how the "peel" looks, we removed from the inner corner of the brows. If signs of irritations occur, remove product immediately and wash off with water and cleanser. 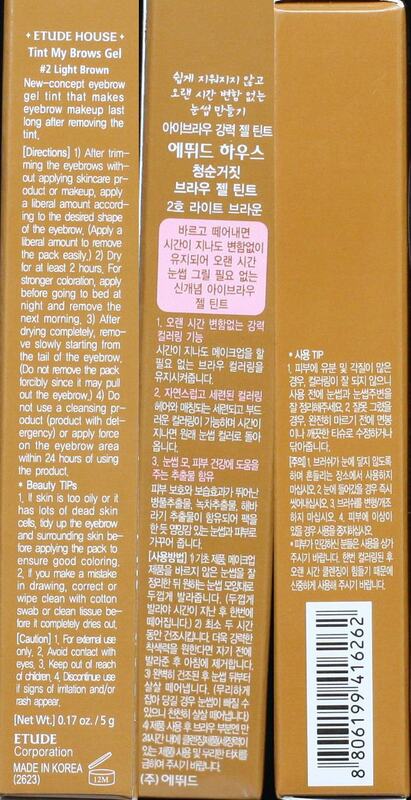 Apply "thickly", do not worry since this will fade off after several days! The reason why it is best to apply thickly is because it is easier to peel off! It is best to start with lighter color so the effect won't be too strong! That's the reason why I picked Light Brown. It does leave a tint on the "skin" so it is best not to wash your face with soap and water when they are "newly tinted". My mom-in-law had her brows done (tattooed) so it's now more of a "Grayish" color than brown. Her hair is golden brown as of the moment and the shade 02 Light Brown is perfect for her! Look at how it tinted not only her brows but the skin as well! She told me the tint lasted 2 days when it was left for 2 hours, and around 3-4 days if overnight! I have seen the effect in person and I am amazed on how natural and nice it looked! I wish it can last longer though but she doesn't mind re-applying because she loves it! Etude House TInt My Brows Gel costs Php528.00 (approx $12.00) available in Etude House stores nationwide. Do you think you need this product? I am definitely eyeing on trying it out myself! Great review and demo! I actually want to use this on my mother since she also got her eyebrows tattoed and it is already fading. I think light brown will be perfect for her too. it's okay! even with heavy hands, as long as you purchase the lighter version :) The effect will be more natural! Nice review! 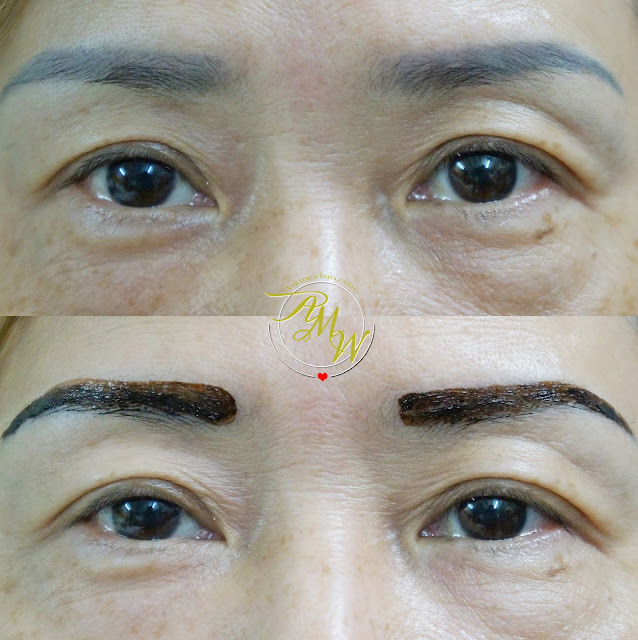 I would want to try something semipermanent for my brows too. I always wanted it to look thicker. Thanks for posting this. 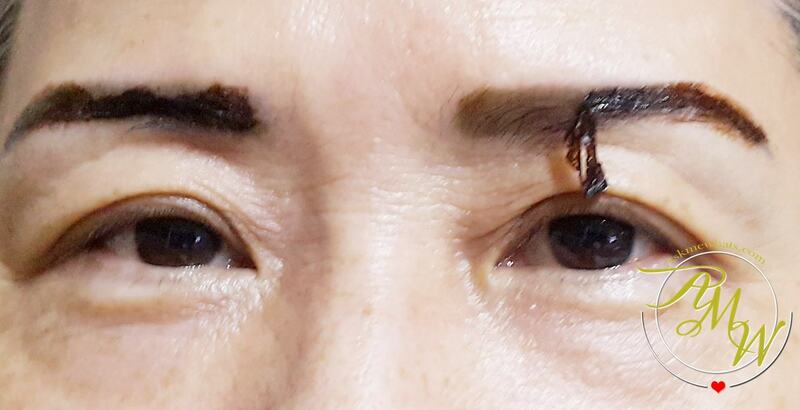 Just like to ask if after mapeel at di mo na achieve yung gusto mo pwede mo patungan ng eyebrow pencil?